Bingosphere | your £35 Welcome Bonus Here! Bingosphere is ready for lift off! And to take you to a galaxy far far away, as the newest online bingo site for 2016! Tipped as the ‘raddest new site in the Online Bingo universe', you should really grab your space suit and make sure you're down for a mind-blowing adventure! Once you board the brand new Cozygames futuristic site as a special space explorer, you'll be rewarded with a generous welcome bonus, plus Free bingo and endless perks and promotions. You can then venture with Marvin the Martian through a wealth of bingo, slots, casino tournaments to seek out your own jackpot riches! When you're ready to start your space explorer mission, you can collect an awesome guaranteed £15 No Deposit Welcome Bonus booster. The perks don't end there, as when you sign up and deposit your first £10, you can kick-start your adventure through space and time with a 350% first deposit offer. Overall Bingosphere will boost your balance with a 500% bonus on your first three deposits. While you enjoy Free Bingo and compete for prizes with Slots Tournaments, the reels are bursting with special offers like weekly Cashback, Money Multipliers, Monthly Moolah and Jackpot Specials! You can spaces-hop through Bingosphere's awesome online bingo tournaments, from Free online bingo rooms to 30 Ball, 75 Ball, 90 Ball and 90 Ball Bingo sessions. You can then cruise over to the slots lounge to immerse yourself in all the top releases like Five Pirates, Arabian Nights, Cupid's Arrow and Easter Bunny. Once you're ready, you can venture to the casino hall to play classics like Roulette, plus scratchcards and entertaining side games. You can then blast through 7 juicy progressive games to try to spin your jackpot fortune! Join Marvin the Martian and the CMs in the friendly chat community to meet the other space explorers, play extra cool games and pick up exclusive prizes! 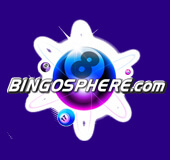 Bingosphere is a the latest addition to the Cozygames network and is regulated by the Gambling Comission. This means you can be assured that you're playing in a safe and secure environment. The banking process is also handled in a safe way as the site accepts a range of payment options like Visa, Mastercards, Neteller, Skrill and more.